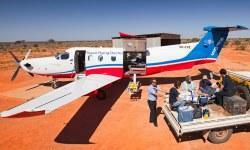 See RFDS aircraft and crews at work during a guided tour of the RFDS Port Augusta Base. The Port Augusta Base serves an area of 840,000 square kilometres, providing emergency aeromedical and essential primary health care services to people who live, work and travel in the far west and northern regions of South Australia. Your tour will include a video presentation on the modern-day RFDS, as well as a visit to the Alf Traeger Communications Room.